Michael Wardian does dozens of races a year—any distance, any surface, anywhere in the world, sometimes back to back, always full on. Almost two decades into his career, he’s nowhere near done. Michael Wardian bounced around his kitchen in split shorts and a yellow-orange race tee, compiling his breakfast. It was 7 a.m. on a Thursday. From counter nooks and refrigerator shelves, he produced one pear, one apple, two bananas, two packets of instant oatmeal, a cup of baby food, a large brioche-looking bun and a 16-ounce carton of blueberries. He eyed the assortment on the counter. It all had to fit in his running pack. “Always a risk bringing blueberries,” he said. He opened the fridge and peered in. “Blackberries?” he said. They came in a manageable six ounces. Blackberries it was. A slim six feet, Wardian has a frizzy brown ponytail, a blocky beard and eyes that look at once happy and tired. He’s always relaxed, never lethargic. Having just returned from a five-mile trail run near his home, in Arlington, Virginia, he was preparing for the six-mile run into work. At lunch, he’d do “hills” on the treadmill; at the end of the day he’d run the commute home. We left the house and a neighbor jogged by. Apparently he never deviated from his daily route. “My wife calls him the most consistent runner she knows. I was like, ‘Dude!’” said Wardian. 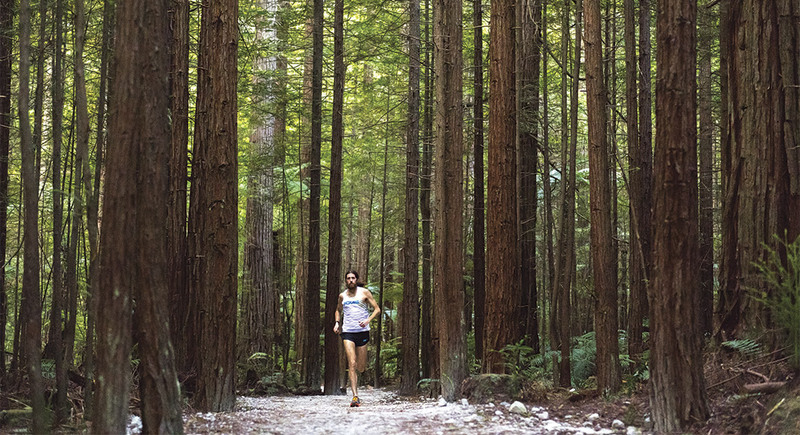 At 43, Wardian is the most prolific elite marathon and ultramarathon runner in America. In 2016, he raced four 100-milers, two 100Ks, two 50-milers, two 50Ks, twelve marathons, two half-marathons, two 10-milers, four 10Ks, two five-milers, nine 5Ks, a vertical-kilometer treadmill competition and a one-mile ascent of the Eiffel Tower. Few athletes even attempt the volume, frequency and intensity at which Wardian races. While two marathons per year has become standard for top U.S. runners, it wasn’t always so. The marathoner Benji Durden, for example, ran 25 sub-2:20s between 1977 and 1986. Internationally, other comparisons emerge; perhaps the most famous is Japan’s Yuki Kawauchi, who has run more than 50 career marathons under 2:16. But what distinguishes Wardian, even among high-frequency racers, is his genre-confounding success. Once or twice a year, Wardian attracts attention for an incomprehensible back-to-back or an obscure, quirky challenge. He holds or has held world records in the treadmill half-marathon, treadmill marathon, treadmill 50K, indoor marathon, indoor 50K, marathon while pushing a stroller and marathon while wearing an Elvis costume. He’s racked up more conventional accomplishments, too, albeit in uncommon quantity. 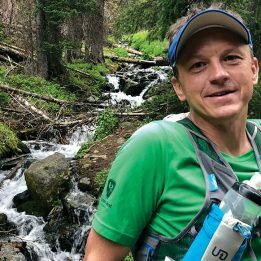 Over a career spanning nearly two decades, he has qualified for three Olympic Marathon Trials, won seven national ultrarunning titles, competed at nine world ultrarunning championships and gone under 2:30 for the marathon at least 87 times. Chatty and accessible, Wardian exhibits a laidback intelligence and unwavering stoke. Despite his success as a runner—and the 20 or so sponsors he’s accumulated—he continues to work full time as a ship broker at a small firm in Washington, D.C., bidding on cargos for an international clientele. A cosmopolitan dirtbag, he peppers his speech with surfer-bro words like “awesome” and “dude” while conversing on everything from running gear and travel to shifting priorities at the Justice Department. One morning, we met before dawn at a trailhead in Arlington. As we trotted through the damp brown woods, the sky lightened to a timid pink and the low, hazy outline of the capital appeared across the Potomac. “People ask me where I live and I say D.C., and they get all sad for me,” Wardian said. “I’m like, ‘No, I love it!’” It wasn’t just the city’s natural beauty, but also its art, its cuisine, its international visitors and, importantly, the three major airports nearby. Wardian never lacked for energy. “He’s always liked to do things,” his father, Richard Wardian, says. “Just tell him what the rules are, show him how to do it and get out of his way.” Growing up in West Virginia and Virginia, young Mike swam, played baseball, explored the woods and broke his wrists three times jumping his bike off ramps. But lacrosse, which he took up in fifth grade, became his main passion. “It was really early on, in the ’90s, so if you had any talent at all you were pretty good,” Wardian says now. “I was dedicated, so I got really good.” As a high-school senior, he told his coach he would end the season with an ambitious 80 points—and reached it in the final seconds of the last game of the playoffs. Wardian taking the win at the 2017 Big Sur International Marathon. Photo by Matt Trappe. The next spring, he finished Boston in 2:54. As Wardian tells it, his early running career progressed through serendipity and blithe exuberance. 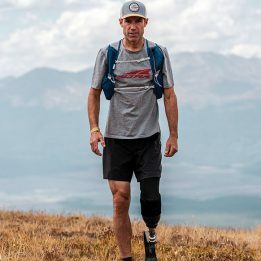 After Boston, he says, “I decided I would do all the big marathons, and just kind of be done with it.” He ran Marine Corp again that fall of 1997, and Chicago and New York the next year. “Then I found out about the JFK 50-miler. I was like, ‘What?! You can run 50 miles? No way, that’s crazy!’ So I did that, too.” On learning that the previous winner finished in 5:55, he thought, “I should just win. I’m 2:40 [in the marathon]. If you double that, that’s like 5:20.” In fact, it was 7:54—61st place. Michael and Jennifer got married on a late-October day in 2004. The next morning Wardian ran a charity 5K dressed as Spiderman. After his first finish at Boston, Wardian had walked into Pacers Running, a D.C.-area store. He knew they had some kind of running team, and thought he might join. “That’s not fast,” came the polite response. It worked. He got faster and faster. “He kind of raced himself into being a competitive athlete,” Farley says. 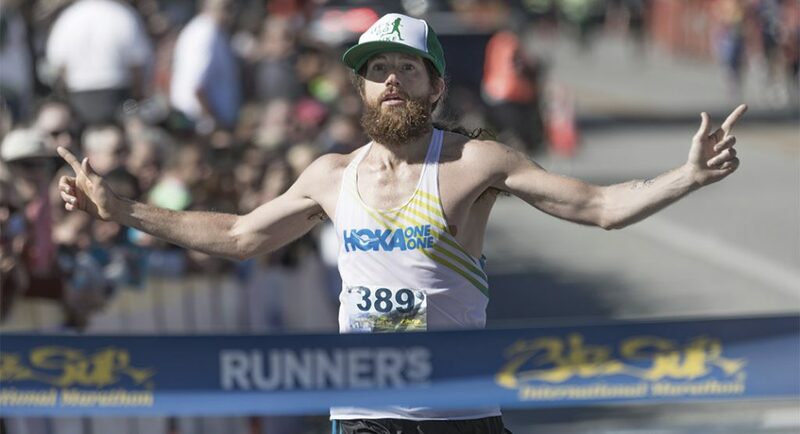 After JFK, Wardian kept dabbling in ultras and stage races. In 2000, he ran Marathon des Sables, the six-day, 250K race in the Sahara Desert, finishing 26th. The next year, he won the Himalayan 100-Mile Stage Race, in India. “That’s when I knew I could do this and just be the best at stage races,” he says. But specialization to the point of missing out has never been his MO, and he decided instead to try for the Olympic Marathon Trials. The boys’ moods ranged from reticent to petulant to oddly mature. Squabbles arose. Out-of-bounds was 10 feet to the left, not two feet to the right. A flag was pulled before the end zone, not in it. The game should last four more touchdowns, not two. Empathetic but firm, Wardian dispensed with each situation, never breaking his cheery calm. Later, I asked if managing the egos of 10-year-old boys ever wore him down. Back at the Wardian home, Jennifer joined us in the kitchen for lunch. She has a friendly face, straight brown hair and an air of disarming practicality. Not herself a runner, she is supportive of her husband’s adventuring, which in part means knowing when to rein him in. Wardian had considered the U.S. 50K Championships, coming up in one week. But when Jennifer vetoed it, he agreed she was probably right. He had just returned from five weeks of near-nonstop travel, which also meant near-nonstop racing. First he’d done an event called the World Marathon Challenge, a seven-day, seven-marathon, seven-continent tour that jumped from Antarctica to Argentina to Miami to Madrid to Morocco to Dubai to Sydney. He’d averaged an extraordinary 2:45:06. After a few days at home, he flew with Jennifer and the boys to New Zealand for a three-week family vacation (and a 100K, and a trail marathon). This is true but also beside the point. Wardian may not have Olympian speed, but he possesses a celebrity disproportionate to his PRs. He has been written up in the New York Times and Washington Post, appeared on local TV news, done numerous interviews for podcasts and blogs and of course prompted can-you-believe-it coverage in running publications (including this one). Partly, it’s because he does stuff that no one else does. But Wardian has also branded himself well. He is known as Iron Mike, a nickname bestowed by friends, and has adopted “relentless” as his motto. He sells T-shirts and hats, printed with MICHAEL WARDIAN: RELENTLESS, to fans. He posts to Facebook and Twitter, relentlessly. And he makes himself accessible to media, whether he’s in a remote park in Tennessee or the San Diego airport. 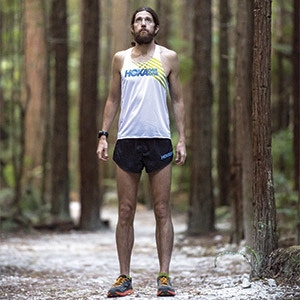 When runners talk about Wardian, they tend to call him a “freak.” It’s meant as the highest praise, a nod to talent so rare it confounds explanation. Not that one can’t try. 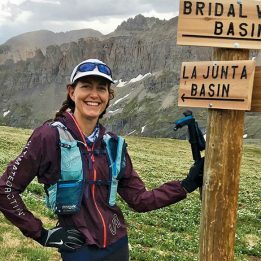 “First and foremost, it’s genetics that provides our foundation,” says Sean Bearden, a professor of exercise physiology at Idaho State University and the host of the podcast Science of Ultra. Anyone capable of a 2:17 marathon is already an outlier, of course. But is Wardian further predisposed to withstand and recover—an outlier among outliers? The answer remains elusive. “What makes somebody a good recoverer is an excellent question,” Bearden says. Competing constantly will also have honed Wardian’s intuition for pacing. “Mike seems to really be able to dial in where he needs to be,” Bearden says. “A lot of people will go too far,” thus causing more damage and prolonging recovery. Then there are the daily choices about training, recovery and health that matter over time. 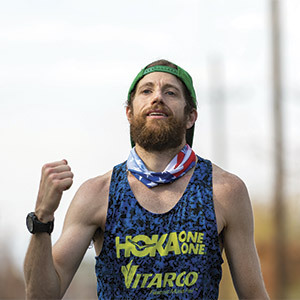 “I think a big part of Mike’s success is he has orchestrated his life and his competitive nature around doing all these races,” says Jason Koop, a prominent ultrarunning coach with Carmichael Training Systems. 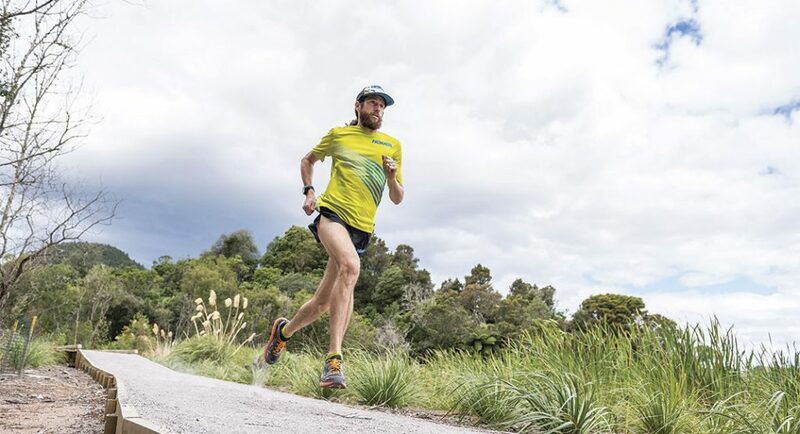 During intense stretches of racing, Wardian replaces mid-week workouts with easier runs. He races year-round, but has his own version of an off-season—taking a break from marathons and ultras to fill his weekends with 5Ks. He eats high-quality foods. He rolls out tired muscles, gets massages, does strength training and engages in “light movement” even when not running. So you don’t think you’re innately talented? I asked. At 11 a.m. on a Tuesday, Wardian broke for lunch to show me one of his favorite weekday runs. Starting near his office on Embassy Row, we breezed past flag-adorned villas, then turned onto a creekside trail. A passing jogger whooped in recognition. She and Wardian high-fived. “It’s weird, I have no idea who that is!” he said, delighted. Paul Cuno-Booth is a newspaper reporter based in Keene, New Hampshire. Follow him on Twitter @PCunoBoothKS. Wardian is truly a talented runner and his down to earth, chill attitude is one for all of us to imitate. Great article!